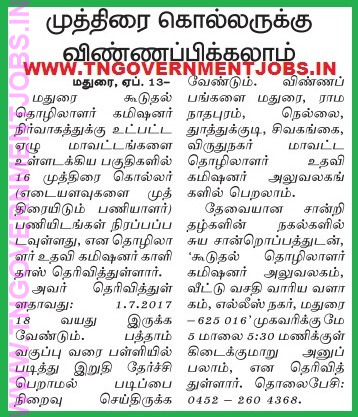 முத்திரைக் கொல்லர் (Stamping Smith / Blacksmith) - 16 Posts; Salary - Basic Pay Rs.4800/- Grade Pay Rs.1400/- plus allowances in Pay Band I-A category (Basic Pay Rs.15900/- plus allowances in Tamil Nadu State Pay Matrix Level 2); Educational Qualification - 10th Std / SSLC completed - Pass or Fail; Age limit - Maximum age - 30 years for UR candidates, 32 years for BC / BCM / MBC / DNC candidates, 35 years for SC / SCA / ST and Destitute Widow candidates. The Post is permanent category / regular basis. How to get the application form? Where that issued? The prescribed Offline application form is available in the following address. The application is free of cost. So, interested and eligible candidates are requested to apply in the prescribed application form along-with all supported documents, duly self-attested to the following address as on or before of the last date – 05 May 2018.